Is "No Hardware" the New Hardware Trend for Kitchens? Is “No Hardware” The New Hardware Trend? As I was designing the mountain house kitchen, something I seriously considered before we landed on Shaker cabinets (which might STILL change, folks) was nixing the hardware altogether. Nothing is more minimal than, well, having nothing. We found so many examples of beautiful kitchens without their jewelry, and while I obviously love what the perfect hardware does to cabinetry, I wanted to explore this clean look further. First up is probably my favorite of all the “no hardware” versions—something with a lip or a pull out of the same material as the doors and drawers. I love what that simple line does to the look and in the same material, it still looks minimal. I can’t tell what they did (above) for the fridge pull as I don’t think just a wood lip would function as well. I also don’t know if any of the lips are as easy to pull as knobs and pulls, but likely these people care about how things look and might have sacrificed a bit of ease for that. To get a closer look, we pulled some zoomed in details and put them together so you could get a better sense for what these look like on different materials and in different colors. So effortlessly minimal yet impactful. This treatment looks the best, in my opinion, when the cabinet door is made of wood, or at least you can see the wood grain through a finish or paint. I don’t think I can ever be minimal enough (especially not at the cabin) to do a flat panel that is just painted a color…give me some texture at least. Well, I say that and then I see this next photo that makes a convincing argument. It’s probably too cold for Brian, but at an office or retail space, this is a STATEMENT I can get behind (but mostly because the lighting and the table and chairs are the stars here). But if you are a serious minimalist and like your kitchen space sparse and clean-cut (and you pair it with those lights and that faucet like below), then I can see it looking awesome. But for me and this house, I would want the wood grain but love it without hardware. I’m assuming a lot of these function by pushing them in a bit (then they spring out a little so you can actually open), although I do caution about this. My friend did this and if it’s at hip level and the countertop doesn’t protrude enough then every time you lean to do anything, it opens. They had to pay to have it fixed. I’ve pinned the below photo from Studio McGee so many times but now I’m realizing that I don’t know how they open. Maybe the top portion cuts back at an angle so it’s easy enough to grab the door and pull it open, but the bottom cabinets…another case of push and pop open maybe? Or maybe there’s hardware there I’m not seeing because of the angle of the photo? Not sure, but so beautiful. It seems like there is a tiny white pull on the bottom right cupboard and a little brass thing on the other cabinet. How do these actually function? Next, we are noticing a lot of circle finger pulls and we like them, for the right spaces. deVOL does them a lot. As we were designing this house, I realized why—you can make them very small and thus they don’t crowd your paneling. It’s like a tiny knob but different and less expected. I’m assuming they have to be deep enough to tuck your sausage finger in there, but those above look pretty shallow so…not sure how functional that is. I think they look great in the right style and space. I wouldn’t do this in a traditional house especially if you are going for something timeless. This isn’t timeless, but it’s cool and fun and adds interest in a fairly simple way. That wood behind that blue is pretty beautiful, especially with the wood stile (the vertical space between the cabinets and drawers). That right there is BEAUTIFUL. Some can get more basic, like a simple rectangle but I like the look and I think it works in something mid-century, contemporary, industrial or new build (AKA, be careful if you have an older style of house). So we’ve got circles and rectangles…why not explore the rest of the shapes and do a triangle? It’s cool and weird, and not for every project but again could be great in a restaurant or some sort of commercial space. I love this oblong inset handle; it’s totally unexpected and in the wood, it’s not loud. It’s simple and quiet but throws you a little bit. What was a flat-front, plain cabinet is all of a sudden interesting and less basic. It’s those little details that kick things up a notch in a way that’s still subdued and sophisticated. Plus, it’s nice that your hand can actually open your kitchen cabinetry. So what do you think? I know that all of these options are only for custom cabinetry and likely only by higher end brands or very well skilled furniture makers. It’s not that many couldn’t do them, but they probably haven’t before. It’s obviously for a particular look, one that favors architecture over style and while it this “no hardware” hardware adds style, I guess it’s less “decorative” because it’s integrated into the piece itself and not applied. My question is, do these work even half as well as a traditional pull, knob or handle? Are they secretly a little bit annoying but you don’t care because you have stunning cabinetry? Are they better for vanities that you use less than kitchens? I really love the look of the wood pulls out of the same material and finish as the fronts and now I’m sold. It’s interesting without the business of traditional metal hardware and it doesn’t feel too trendy since its just a piece of wood that is acting like a pull. But what say you? They are quite common in Europe and I have lived with a handleless kitchen for a few years and I loved it! You get used to handling it quite quickly and in my opinion they work just as well as handles! Also I’m very clumsy and don’t have to be afraid to run into any hardware and get those nice bruises on my thighs haha! I know Ikea have a few handleless options if you want to check some out! In my opinion handleless is a lot more timeless as the hardware designs and trends change a lot and I am also a big fan of the clean design! My own kitchen, Immagina by LUBE (ah! not a very English-friendly name :D), has 7 styles for the inset grip just for that one model, plus the inset handle one, plus the handle on top one, plus however many hardware options that I don’t even know about, ’cause I went straight for a clean front style. My fronts are just plain panels, with on the top, bottom or side a 1 1/2″ gutter that allows me to stick my fingers in and grip the cabinet door and open (it’s the Immagina Neck configuration if anyone wants to see how it looks). Of course, some of the kitchens posted here look astounding, but it has to do with the material and deviation from the standard model than the style itself, which is quite normal, here. Agree completely with you. I live in Europe and I have handle-less cupboards in my kitchen too. Easy clean-up, looks sleek and no fuss. Highly recommend. I think you have found the perfect solution for the mountain kitchen! No hardware feels exactly right for what you and the team are trying to achieve with the space. I agreed with several comments in the previous kitchen post, that the brass, while beautiful, just felt out of place in the mountain house. It doesn’t “fit” and seems to shift the mood from Scandi-Cali to glam, whatever shape you choose! As for the different options shown, I felt the first group “cabinets with wood pulls”, or even the very first photo, best fit the style at hand. The other options, while exquisite (I literally gasped in awe at the triangle cut outs), are not traditional enough, as you mentioned. I second Ghalia! Something like the first image or the walnut? close-up is what your Mountain House needs! I completely agree. These flat doors with wood grain are what I thought she go in the cabin. I held my thoughts on the earlier discussion about the Shaker cabinets. Sure EHD could make them work but you should do something fabulous (and painted Shakers are very common). An earlier post stated that Shaker would always be timeless in Modern Traditional style but the cabin is not Modern Traditional. If the ceiling really bothers you, stain/paint it, decide on the floor, so you can pick an interesting wood for the kitchen cabinets. Then I think you can create a real Scandi/Rustic kitchen. Agree! Cabinets with wood pulls for the win, they will look gorgeous and work perfectly! Love the flat front cabinets! Enough shaker already! Have had my white ones for 10 years now and never again! The little ledge is dirty and corners hard to clean because I have other things to do! Anyway I vote for any pull you want just no Shaker! Love, love, love the top 3 kitchens. Natural wood integrated handles look beautiful. I agree that the painted ones need texture, at least for my taste. I don’t love the cutouts, but I do think they’d be more functional for visitors. (Guest stands in front of silverware drawer staring quizzically…) I worry about the damage/wear to the wood with repeated use, but that happens at my house anyway because someone refuses to use the knobs I painstakingly chose and installed. 😤 Also, cleaning my cabinet fronts in general pains me; my next kitchen will have ZERO grooves, handles or other crevice to collect grime and flying vegetable matter. (Apparently, we are pigs.) To summarize, give me all the flat, naked cupboards…in luscious, natural wood. I like this trend! Perhaps becuase I’m an aspiring minimalist. So pretty but so many look so unpractical, my nails would be ruined QUICK! Try before committing. We stayed in friends gorgeous award winning home overseas for a week with ‘no hardware’ cabinets (similar to photo 5). The push to open door fronts were fine, but drawers were really awkward and uncomfortable to use. The appeal is they are so clean lined and super easy to wipe down! Looove integrated handles for the mountain house! I love this look but I wonder if it wears the cabinet faster. If your oily fingers are always grabbing the door itself rather than a knob I would imagine the finish would wear away quicker. I agree with this, my sister had cabinets without hardware and having your hands on the wood wears the cabinets quicker, even if you are meticulous with keeping them clean. I love the look as well, the photos above are beautiful but from a realistic point of view, changing out the cabinetry or spending the money on refinishing because they’ve worn is just too expensive. That being said, a vacation home may be the perfect place to experiment a bit, since the wear should be pretty minimal. my hands are constantly wet while cooking and unless you are meticulous about drying them every time you need to reach for another spoon or plate, it really takes a toll on the wood. all those finger pulls and notches make me cringe. I feel like I’ve stayed at rentals with these and the wood just feels grimy – ick. For fridges without handles, Thermador has one! (It is opened with a knock). Miele has a dishwasher like this too. our old kitchen was built without any hardware on the cabinetry, just slab oak fronts with a small lip to grab. There was a small bit of wear on some of the cabinets, but the old cabinets were 25 years old so I’d say that’s expected at that point! And the wear wasn’t bad at all all. Thanks for the wonderful post and have a great day! Our kitchen drawers have an inset pull notch that runs along the bottom of the drawer, and they’re super comfortable to use. (It also helps that they’re original to the 1959 kitchen and made with dovetail joints. We really did make things “better” and “to last” back then, didn’t we?) So much of our kitchen has been upgraded – as in, everything else has been upgraded – but the drawers feel timeless, and now a little hip. The first image is it! I said the shaker was the your best so far (mostly to avoid the vertical grodiness), but said I’m not sure if you have hit it. I think you have now. Of course, it is always fun for me to spend your money on this project, but that top image is the look you are going for, I think. Cabinets with wood pulls! Love it! So pretty, and because there ARE pulls, I don’t think it will get dated. I also worry that if I need a push mechanism to make the doors and drawers work, that’s something that can break or cause me headache down the road, no? I personally love the look, and I actually think it isn’t as unpractical as it seems. The normal handles in my kitchen are driving me crazy, much harder to keep clean than a clean front! Go for it! The cabinets in our 1964 MCM house have inset pulls and for the *most* part I do like it. However there was one bit of design that was not truly thought out: the insets of bottom drawers are on the bottom! So to open a bottom drawer you have to bend all the way down to grab under the drawer. It’s pretty annoying. We do have plans to renovate the kitchen (we don’t have a dishwasher and it’s honestly not laid out super efficiently) but right now I’m planning no hardware. 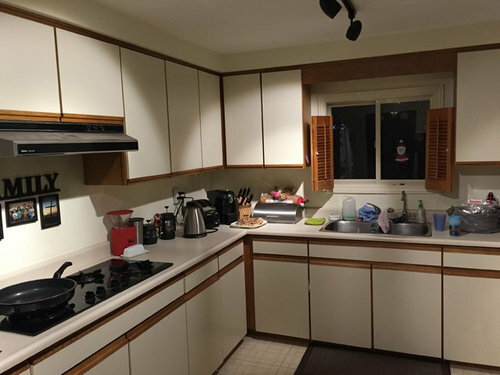 Probably shouldn’t admit this… but when I bought my house several years ago the kitchen had been updated by the previous owners. I could tell they weren’t ‘quite’ done with everything, including buying and installing hardware. It was (and still is) my first home. At the time hardware wasn’t in the budget and I wanted to see what options were out there. Years later I’m still not inclined to spend that kind of money on pulls I really like. So I continue to use the kitchen daily with no hardware. I’m single, no kids and pretty tidy. I occasionally scrub down the corners of the most opened pieces but don’t even notice it anymore. That being said, it’s not a great option, but if I can live with units intending to have hardware that don’t… I think I’d be in heaven with any of these intentional no-hardware units! I really like the triangle cutouts since I tend to grab the corners to open mine. Your comment made me think of my parent’s kitchen. They built their house in 1996 with the standard 90’s honey oak doors and have never installed hardware because my dad refuses to put holes in his wood doors. We grew up that way and the only drawer or door we ever had an issue with was sometimes the silverware drawer (but only because we would grab the corner and sometimes pull it off the drawer track). No idea why people think hardware is an absolute must! Too funny! We also ran out of money building our home in ’99, (coupled with my complete inability to make one more choice! ), so have lived for 19 years with no pulls. I actually forgot that I didn’t have pulls until I read this post and looked over at my kitchen! It’s never bothered me and I like the clean look now. I remember choosing my cabinetry all those years ago. It’s so much easier to design for someone else. So my suggestion is, choose the style you’d choose for a client. I agree with Susan who suggested you stay away from using Shaker cabinets. Be bold. The mountain house should be fun, different and unexpected. You’re on the right path. TRUST YOURSELF! Yes! Emily, do this in your mountain house. It’s so so beatiful! I really like no panel cabinets without hardware: It looks so clean and simple. This looks much more custom than the shaker cabinets. I’m sure you’ll make the best decision for the space as you always do. Wood cabinets with the wood lip get my vote! Thanks for the wonderful post. I love the look and really wanted to do something like this with our kitchen. We tried the push open hardware, but it just wasn’t very user friendly. The compromise was black hardware on our black cabinets, so they’re there but they blend in well. One thing we haven’t nailed down yet is the backsplash. Do you have any thoughts on how the wall in the first picture could be replicated? It is ridiculously gorgeous. I can’t stress enough how very wrong white shaker would be for a mountain house. In this day and age white shaker screams builder basic to me! Clean front wood is exactly what you should be doing! Deep in your hearts you all know this is true, and I’m sure you will find a way to make it happen! Can’t wait to see the final results!! While I think it’s a bit harsh to declare all white shaker to be builder basic, I do agree that for this house, slab fronts are the way to go. I feel like Emily got coerced by the contractor to do something other than what she really wanted. We’ll see. Lots of times I don’t agree with the idea but then I end up loving the results. Trust EHD to get it right. These are all beautiful kitchens! I love this and think you could definitely pull off a similar look in your kitchen using natural wood. My one bone to pick here is calling this a “trend,” I think it’s more of a stylistic choice and can certainly look timeless in the right house. We have enough design trends to contend with already! Love the look but wonder how my kiddo would ever get some of the little notched ones open. His fingers aren’t strong enough – especially on the circle ones. There’s no way he’s getting a drawer full of silverware open with one little kid finger. the first image is perfection. I would so do that if it was my mountain cabin. This was popular back in the 90’s. My kitchen at that time had no hardware. It doesn’t take long for the finish to be ruined because of all the constant handling. We had beautiful custom cabinets with a wood finish and they were pretty messy looking within a few years. Just something to consider if you’re thinking about going in that direction. We had ours refinished and added hardware eventually. Finishes are better now. It does take maintenance but I don’t find it to be a problem. Handles and knobs also need to be cleaned and polished, they break off and need to be replaced. Nothing is perfect. Break off??? Must be super cheap handles ’cause I’ve never seen this. Maybe the screws are cheap and break? I’m having a hard time picturing this. Yes. A couple of these pictures look very early 90s to me. And you still see it and it looks dated. I agree that the wood gets dirty where you touch it and eventually it looks different — worn but in a bad way. The push and pop system is called touch latch. I think the inset rectangles are good looking and more practical than some of the other options. Dare I say the lip looks…. rustic? I grew up with shaker cabinets in the kitchen and bathroom, both without knobs (for a while, then my mom added knobs and handles in the kitchen). For the bathroom, gripping the raised Shaker edge part is totally fine, and there’s really only one drawer I use. In the kitchen, though, I have to say that no hardware is fine on the upper cabinetry (doors are lightweight) for accessing dishes and whatever. But drawers really need knobs or handles– particularly for drawers holding pots and pans and silverware (high-use and also heavy!!). While not super glamorous, you may also want to keep in mind accessibility: guests or older family members with arthritis can have a hard time without something to grip. I’m 100% team no knobs whenever possible. Current kitchen has matte white Ikea Voxtorp fronts, which are designed without handles. They’re angled at top so your fingers can grip and open. I wrapped the cabinet sides and island back with walnut. Previous kitchen, I replaced the cabinet knobs with 2″ recessed brass finger pulls. I wanted to streamline the entire kitchen and minimize any distractions to make the space feel more expansive. I also added a pull out pantry that was too heavy for finger pulls, so I had a wood pull bar installed on that. Ooh, I hope this means there is still a chance for wooden cabinets in the mountain house kitchen! As I commented on the white Shakers post, they look good, but lack that mountain natural vibe. (realizing styling could shift that I suppose…) I like most of these examples, esp the oblong and the round finger hole, and some of the self colored wood pulls. Not so much the rectangle cutout which looks cheap basic Ikea-ish, and not the 80’s style bicolor pull ledge. Just pick something easy to wipe out because you know they’re going to collect grime from touching the panel directly so much, and crumbs if they are a trough shape. I really love the wood pulls. It blends in seamlessly but is still 100% functional. DO IT! The first image of this post looks like a kitchen that would fit right in to your mountain house. The walls would echo the look you have going for the fireplace and it pulls off the simple and natural/rustic look you are wanting for the home. I have to be honest, I did not really feel any of the previous kitchen renderings for the mountain house. They were all lovely in their own right, but just didn’t seem to feel right for this space and the feeling you want there. This image reminds me of the duVol kitchen inspiration photo that you love and makes me wonder if there is still a way to get that style/feeling for the kitchen in your mountain home. I hope you are able to land on creating a space that reflects your style and feels like home for your family. Wow! I’m shocked with the positive comments. guess I am out of it, I love hardware. But rustic for your Mountain home. I agree about White shaker but colored is another story. I love the deVol ones that you first wanted. Go back to that, stained but not rough. I was in the camp about the brass faucets but recently saw the patina-ed unfinished brass and it was awesome. now i understand! go for it, which you already have. I’m kind of bored/disappointed at the idea of shaker cabinets in the mountain house. I know you’ll do something beautiful, but I also want to see you push the envelope. Why not do something more interesting, like have custom wooden lips or wooden molding as handles? I think it could be both functional and interesting. No shade, I’ll be watching with popcorn either way. Been there, done that! The wood gets so discolored after a few years and it’s not very practical, especially when you do use your kitchen, i.e. cooking and prep work for cooking. It looks dashing in pictures of brand new kitchens, but I would never consider it again! Now having said that, I do have a slick white vanity in the bathroom that works with springs – you just tap the door and it opens by itself, I love it! I could see it on kitchen drawers, but doors? Nope!! I hate those cabinets sooooooooo much!!!!! So, we had (have, but they are grown!) five sons. While these are stunning examples of beauty, it is soooo-o-o-oo much easier to wipe the “sticky” off hardware than to have to wipe down wood cabinets. Kids are kinda brutal on cabinets in the long run – hardware can minimize the impact. I think you found the perfect solution! I love the seamless wood pulls. And I have never loved a kitchen more than that first image you shared! Gorgeous!! As a kitchen/bath designer for over 25 years….my biggest concern with no hardware is how the wood finish ages/fails. When we are really ‘using’ our kitchens our hands are wet, maybe even have some food residue and that wrecks havoc on surfaces. You will see this the most on cabinets you use the most., especially under the sink. The finish will wear off and the wood starts to degrade or even warp on stile/rail door styles. I share your concerns. This made me think of a kitchen I saw in a magazine years and years ago. The designer had chosen highly polished long chrome grabs. As soon as I saw the photos I thought it was a crazy choice, they would get so dirty! His reasoning was that in a kitchen where things need to not only look clean, but truly be sanitary, highly polished handles look dirty faster and therefore get properly cleaned more often. By that logic, wood cabinets with a pronounced grain and pressure latches are a terrible choice. I personally like the look and function of slab fronts with the little brass or chrome flat grab that hides at the very top of the drawer or cabinet. And please don’t laugh at how ridiculous this is, but I am currently paging through old Metropolitan Home magazines from 2005 (so I can recycle them). One home had a genius idea for upper cabinet doors with no hardware. Order the doors two inches longer that the frame in order to create an overhang that eliminates the need for handles. Which would also be great for hiding other things behind that overhang, like downlighting for example. LOVE this look and think it would be absolutely perfect for the mountain house! Love the wood/lip pull and the rectangle cut out. The first pic is my favorite!! We had flat front cabinets without hardware in our old kitchen (original from the 70s and painted white) and the doors / drawers looked flat from the front but the side where you open was angled for your fingers to grab onto and they were super comfortable to use and looked so clean and simple. I loved them. Super excited about this last minute change! I think I would prefer the plain front withought the built in pulls. When the styles change again, you could add hardware if you chose without it looking awkward. I like the look of the wood pulls for your kitchen, but it makes me wish that you could have stained wood cabinets even more! As far as wear and tear, it’s a vacation house. I don’t think it will suffer the same abuse that a normal house would, and it’s more likely that you’d tire of the cabinets themselves before they wore out from having wooden pulls. I agree that the first image is perfection and is my idea of a modern mountain house. I think what I’m responding to is the stone wall. It brings a sense of being time-worn to the kitchen, which I think is ultimately what makes a mountain house feel warm and cozy. While the wood on the island is rustic, I think the black stain modernizes it in a way that loses some of that “I’ve been here forever and have a history in this house” vibe. I think the current kitchen plans will produce an amazing kitchen, but maybe a kitchen that reads as a new build rather than a cozy cabin with a history. But now I’m starting to think that I’m just projecting my own vision on this project, so ignore me if I’m totally off base! Beautiful, but food, grime and moisture traps. I know…especially with little kids in the house. I’m personally not into this look but for a mountain cabin I can see it working. That first photo is gorgeous- just make your kitchen look like that and call it a day. Time to start enjoying the house! Inset pull notches can be AWFUL to clean – if grimy little fingers get in there and leave gooey residue, it’s really, REALLY hard to ever get that out again if the notches are too small. Absolutely love this look. Clean lines and minimal. I’ve had handless and didn’t care for it. I’m a messy cook, for one thing, and if there are no handles, you end up getting gunk on the actual wood. Handles are easier to clean and don’t stain like wood can. Not crazy about the look, either. Oh, and I HATE those magnetic closures (they seem so 80s to me –makes me think of cheap stereo cabinets from that decade), because they’re just a pain. If you press them too lightly they don’t open, if you press them too hard they fly open. long term. As in you are old and potentially disabled, or with arthritis that has swelled up your finger (that finger hole would SO NOT work for me). If you have hands that hurt a lot, are you going to want to push in your drawers to open them? Will you be able to even grasp that little micro-knob? You can always change out your hardware as things change of course, but if the cabinets are designed this way to start with, that could get expensive. They look beautiful. How well do they meet the criteria of Universal Design? I have severe hand arthritis and would find some of those doors painful to open. When I did my own kitchen recently, I choose pulls that were wide and projected far enough from the cabinet so that I could easily put my hand in and pull the doors open. This is a winner! Integrated hardware seems like the epitome of ease at a vacation house. Fewer nooks for dirt and dust, less visual fussiness, really letting the black island and light fixture grab your attention. Please, please redesign your cabinets to be like the ones in the top photo – just make a commitment to a floor! Maybe in the kitchen, the floors could even be whitish, as in that top photo. The ceilings are lower in there, so it would be congruent to have the flooring material differentiated as well. Please do this! It looks so simple and yet so custom. Just what you wanted!! I think push to open cabinets would get very dirty!! My favorite is the first picture. Do you happen to know what kind of wood those cabinets are? And what would you do instead of the rock wall? Sheet rock painted in a fun color since the hood is white or maybe tile?? And those concrete floors, they are so cold looking. I love wood floors but do not know what type of wood coordinates with the cabinets. Can your beautiful vision and experience answers those questions? THANKS! ps I do think the wood pull cabinet’s either painted or not would look good in your the mountain home! These are beautiful. I LOVE you, but I have to say I’m not feeling the current kitchen plan. The shaker cabinets just feel like they don’t belong in the house you’re designing (and I adore shaker as a general matter). I’m also not totally sold on that black wood, but I trust you. If I were you, I’d do something similar to the picture with the green painted wall and wood. It’s so warm and different. I love the lack of hardware on that wood. You have green accents throughout the house anyway, so it feels right to me. I think it feels warm and luxurious and different. I also like the first picture a lot. I think the fixture you already have in mind for over the island would look great with either of those options (but ESPECIALLY the wood and green). I know you won’t go back on that black wood, and I’m sure I’ll eat my words when I see it, but it’s just a thought. Emily ~ I LOVE your blog and your designs! Just a thought ~ for older people and those who have handicaps, pulls are easier to operate. I recently renovated my kitchen and after much thought, used pulls on both the upper and lower cabinet doors. I would have preferred knobs on the cabinets, however, sometimes the friendliness and function of the design trumps beauty. I am still very happy with how my kitchen turned out. Thank you for ALL you share. So. Much. Beauty! NoOoo…don’t fall for it!!! While I do love the look of all these modern handle-less cabinets, unfortunately, I have an ugly handle-less 1960s kitchen and I hate it. There are little routed out grooves on the bottom of the doors (or the top of the lower doors) and each drawer has a smoothed out groove along the bottom front for pulling. This being a rental, 50 years worth of dirty/wet/sticky/floury fingers have been pulling on those doors and drawer fronts and nothing I do to clean them (except maybe a sledgehammer!?) can remove the disgusting goop that has collected there. So I am definitely Team Hardware…at least they can be cleaned more easily. Hi Emily. Although they are ‘pretty’ and perhaps artistic. The idea of ‘no handles’ is inconvenient, some people will actually be unable to open any of the cupboards if they have slightly less than perfect use of their hands and fingers. And, having holes in your cupboard doors kind of defeats the purpose of the cupboard door. Finally, the idea of poking your cupboard doors to open and close and relying on a spring type mechanism would make for not only greasy finger prints everywhere but cupboards that were essentially locked or hanging open when the sparkly mechanism chose to break. There is a reason handles are there. They serve a very important purpose. I guess the best idea would be to keep any drilling to a minimum and make the positioning generic so that you always have the option to change the design of your cupboard handles when fashion changes. Ummm just saving this entire post over here – BEAUTIFUL kitchens! Thank you for the eye candy! I absolutely love these no hardware kitchen cabinets!!!! Every single option is gorgeous and timeless. LOVE THEM. It makes me wish I was remodeling my kitchen. Our house is very traditional, built in the early 2000’s in north Texas- not “modern” by any means. I believe every cabinet and drawer in the house, come to think of it, is without knobs. I feel like it’s very common in the homes I’ve lived in. I think no knobs is more efficient and prefer it. The homes I’ve lived in aren’t fancy by any means. I think knobs are fancy. Personally, I’m really enjoying the revamped styles of knobless cabinets. I agree with other readers that these types of cabinets have been popular in Europe for years. I just installed a new kitchen in France that was handleless. The only down side is you do often see greasy hand marks but these are easily wiped away. Time will tell how this kitchen holds up to the wear and tear of life but they look very nice at the moment! I think the first version that has the handle built in would be the best idea for a family since there are no extra surfaces to get dusty. Also, little fingers can open the drawers easily and not get everything extra sticky and gooey…and if they did, you’d be able to see it! The other styles would conceal the goo. Having had shaker cabinets, I know that those crevices need cleaning and dusting regularly to stay fresh. not sure you want an extra surface to deal with in a weekend/vacation house. It also seems like it would do everything you were looking for–look custom, show off the wood grain (for Brian) and not look busy. It’s like a compromise without compromise. YES! No hardware and NO UPPERS! Its a vacation home, how much storage do you need? Americans are OBSESSED with needless storage. Not redoing my kitchen, yet, but love the look of the wall in the first photo. To get this look, just go to a tile/stone store? Anyone know if it’s more expensive than tiling/backsplash? It seems like handleless cabinets were popular in the late 80s-early 90s. They were hard to keep clean, especially if you had kids. Most people ended up putting on hardware because they got tired of dealing with it. It might work better in a vacation home since you won’t be using them daily so there just won’t be as much wear and tear. I love the no hardware look, but I will say, the finish on the wood gets dirty after awhile. I think about how hard we are on our cabinets (5 people in the house) and also about the cabinets I grew up with. They were minimal wood panel doors that sat on the outside of the cabinet base and had a recess area behind the door that you put your fingers in and pulled. For most of my life in that kitchen, I remember those cabinets as, meh. But then my mom had all the cabinets refinished and they were pretty glorious. The finish had just gotten gummy as old wood furniture can sometimes get (arms of chairs), but once redone, WOW. So for a lot of those no handle looks, I see a metal plate added later where hands will touch a lot. Still kinda minimal, but not the same. Still from pure looks, these are gorgeous.